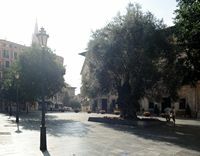 Located in the southwest of the Plaça Major, this part of Palma concentrates most of the institutions of the Majorcan capital. The Can Berga is located at No. 12 of the Plaça del Mercat. This beautiful home belonged to the Berga family from 1677, the first owner of this family have been Don Gabriel Berga i Santacilia. His son, Don Gabriel Berga i Zaforteza was around the year 1760, the initiator of a radical transformation of the building. 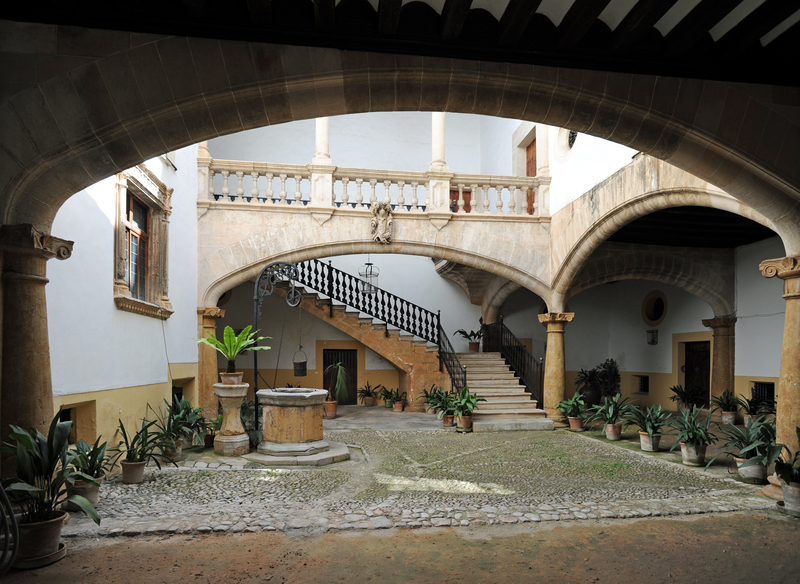 The front is a bit heavy with the stone balconies framing the portal, the portal arc decorated with the arms of Berga by sculptor Juan Deya, gives access to the patio. 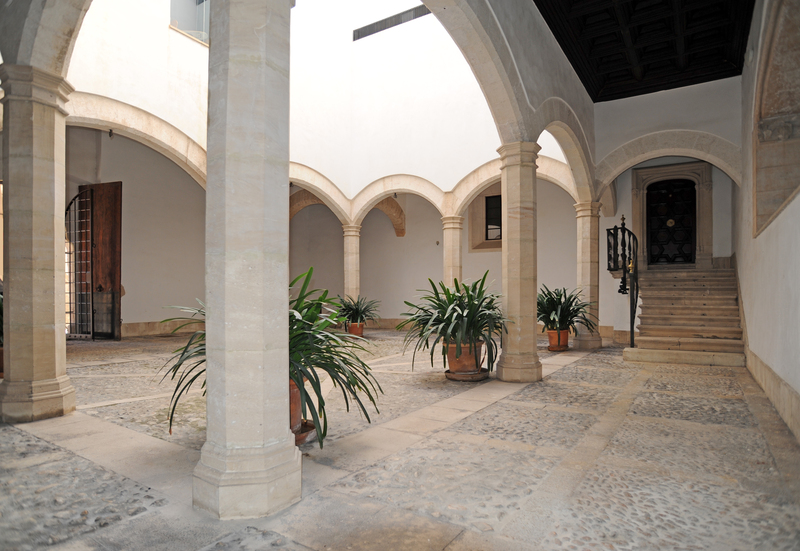 This large patio, arcaded Baroque, reproduced, adapted to its scale, the order of Majorcan patios. In 1942, the Can Berga was sold to the Ministry of Justice, the current owner, it now houses the Palace of Justice. The Can Casassayas consists of two modernist facades corrugated buildings. The church of St. Nicholas is a parish church dating from the fourteenth and fifteenth centuries. The Can Forteza Rey is located at the corner with Carrer Monges. 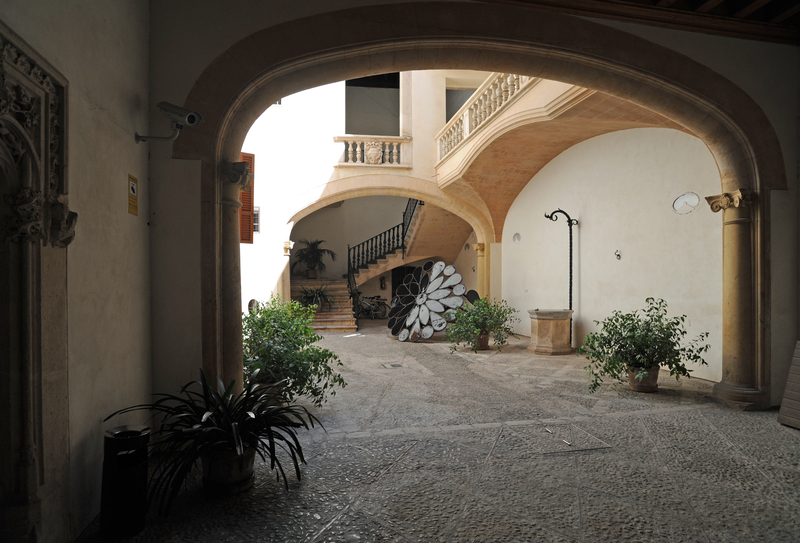 Besides the Can Forteza, El Àguila is a former warehouse that has decorative elements influenced by the Viennese school, including the arch and its ornaments. At the corner of Carrer Jaume II, you can admire the Can Corbella, designed by Nicolás Literas in a pre-modernist mixed influence Neomudéjar. In Carrer Colom, which opens to the south of the Plaça Marqués del Palmer stands the Can de las Medias building covered with ceramic. 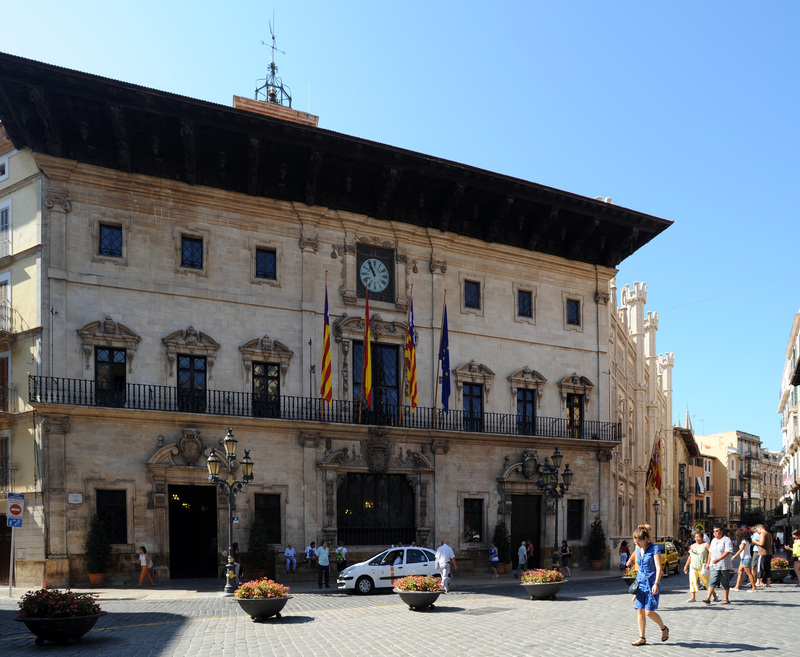 Square of the Cort owes its name to the fact that gathered there the court of the city (cort, in Catalan), the place is now dominated by the town hall of Palma. On one side stands an olive tree (olivera de Cort) transplanted from an area near Pollença. 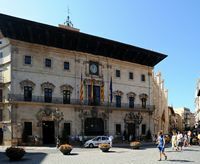 The Town Hall, colloquially called the "Cort" is housed in a palace that was originally in the sixteenth century, a Gothic hospital. The exterior of the existing building, Renaissance, dates from the seventeenth century and into the nineteenth century style. 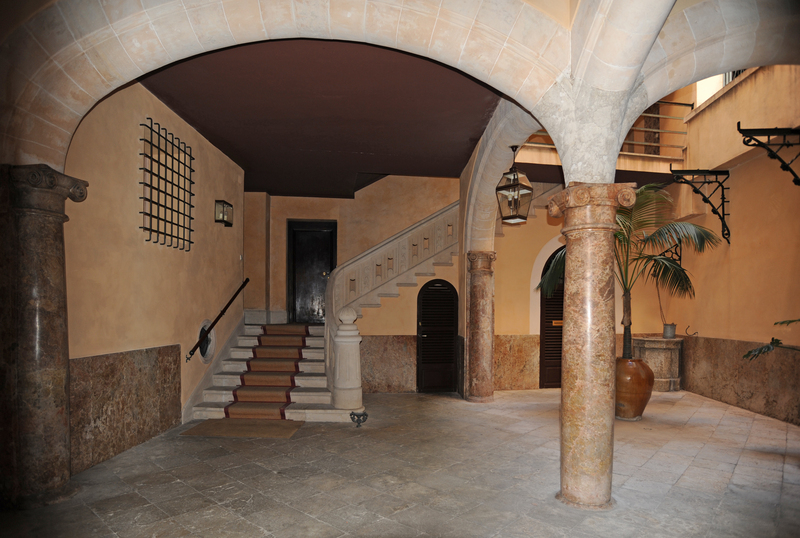 The building was originally the headquarters of jurados, executive arm of the former kingdom of Majorca. 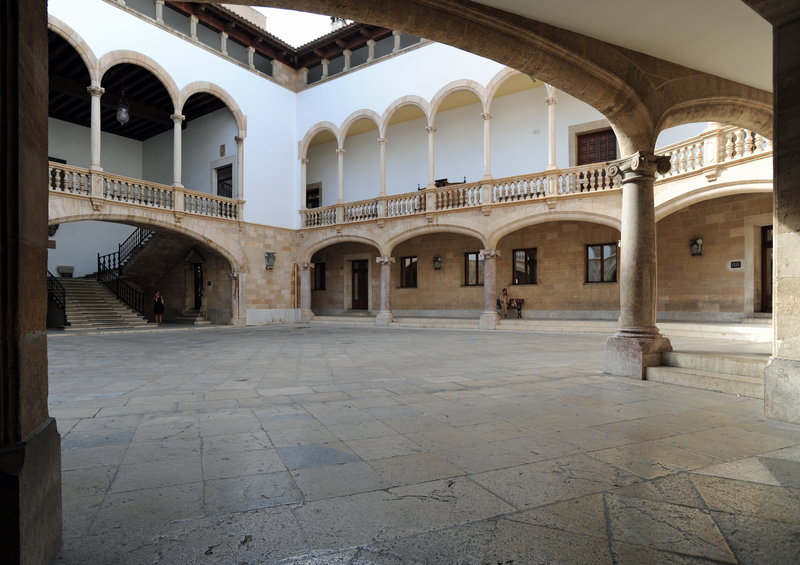 Following the changes that occurred in the eighteenth century, the municipality of Palma inherited the building and furniture of the former University of the Kingdom of Majorca. On the top floor of the main facade is "En Figuera" and what colloquially called the town clock. The current system dates back to 1863, but a clock struck the hour here for centuries. The eaves carved, supported by caryatids, dates from 1680 and is popular with tourists and Majorcans to shade it provides the hot hours of mid-day. 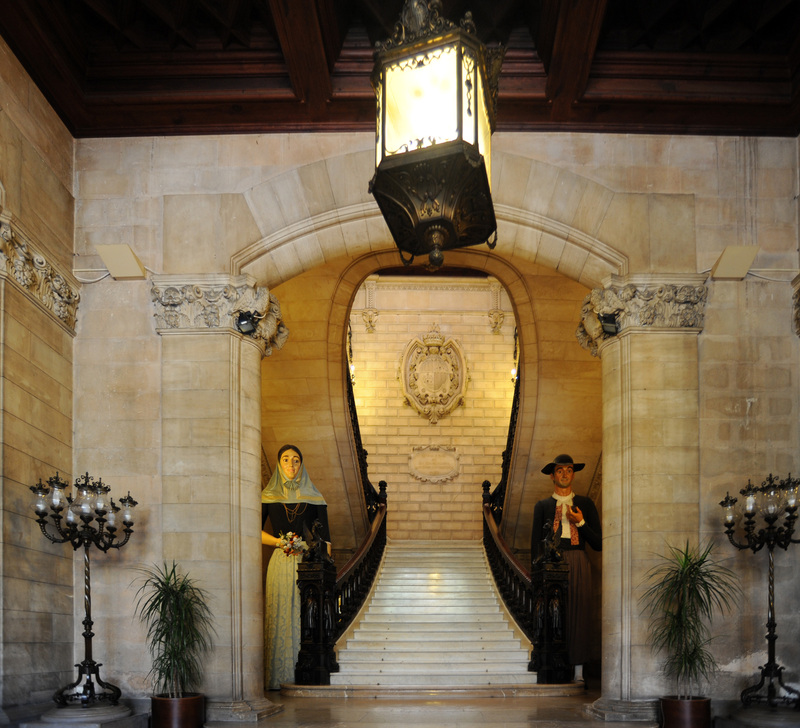 A visit to the Town Hall is limited to the lobby, where you can see a Gothic portal and a beautiful staircase. 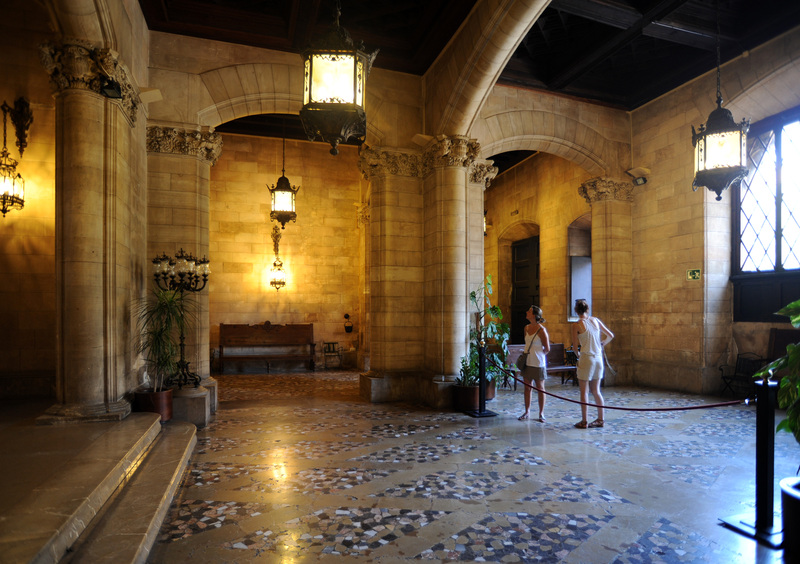 The more adventurous can venture into the library art gallery which presents a gallery of famous men of the Kingdom of Majorca. In the hall are exposed few giant mannequins depicting kings, queens and other characters who parade around town on the shoulders of the people during the fiesta. 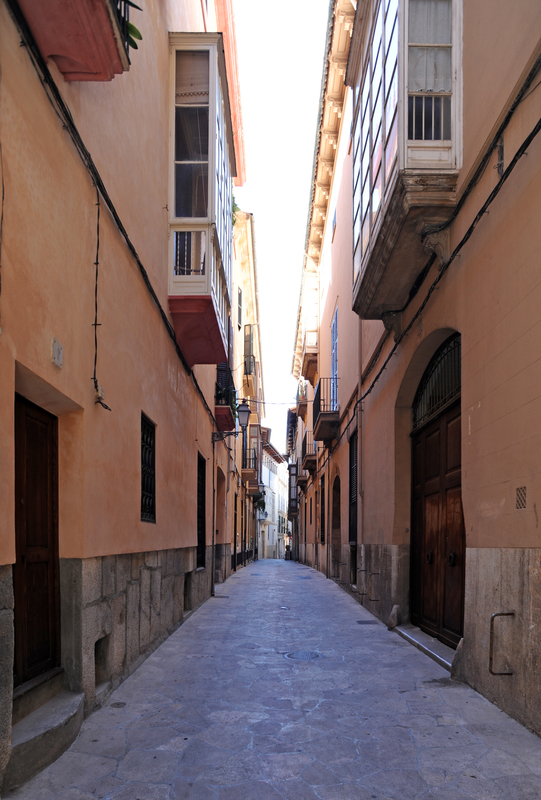 Right in the Carrer de l’Almudaina is a door in the wall of the late Roman period. The church of St. Eulalia is located on the St. Eulalia Square, near the Plaça de Cort. The church, dedicated to Saint Eulalia of Barcelona was built in the thirteenth, fourteenth and fifteenth centuries, it is the oldest church after the Palma cathedral. This church has historical significance for the Kingdom of Majorca, for it is here, September 12, 1276, that was crowned King of Majorca, Jaume II, son of King Jaume I of Aragon, granting privileges and Treaty autonomy of the Kingdom of Majorca. 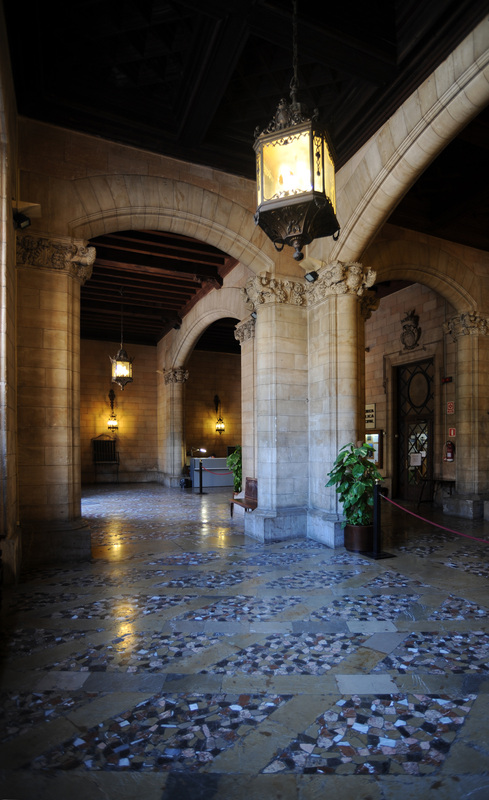 The building is very representative of the Catalan Gothic. Outside, a terrace, which partially surrounds the ceiling of the nave is decorated with gargoyles depicting dragons, harpies, and basil… typical representatives of the medieval bestiary. The tower, which dates from the nineteenth century, is tall, with a tapered cover. The church has two entrances: one on the neo-Gothic façade, the other on the left side. Inside, a very bare Gothic has three naves, the St. Eulalia church is characterized by a much higher and wider than the nave aisles. The nave is decorated with many windows. The altar is churrigueresque (Spanish Baroque) and is the work of the Dominican monk Fray Albert Burgunya, as well as the seven chapels in the ambulatory: those of Santo Cristo de la Conquista de Santa Catalina, San Luis and La Piedad de Cristo. The St. Eulalia home in the first chapel on the right, a magnificent Gothic altarpiece of the fifteenth century. This beautiful set was restored in the early nineteenth century. Visiting hours: Monday to Friday, from 9:30 to 12:00 and from 18:30 to 20:30, Saturday from 10:30 to 13:00 and from 18:30 to 20:30 and Sunday from 9:30 to 13:30 and from 18:30 to 19:30. At No. 4 Carrer Can Savella, Cal Marquès de Vivot (or Can Vivot) was built around 1725 by Joan Sureda i Villalonga, first Marquis of Vivot. It occupied the site of the medieval remains, since the seventeenth century, the Sureda family before Villalonga family. 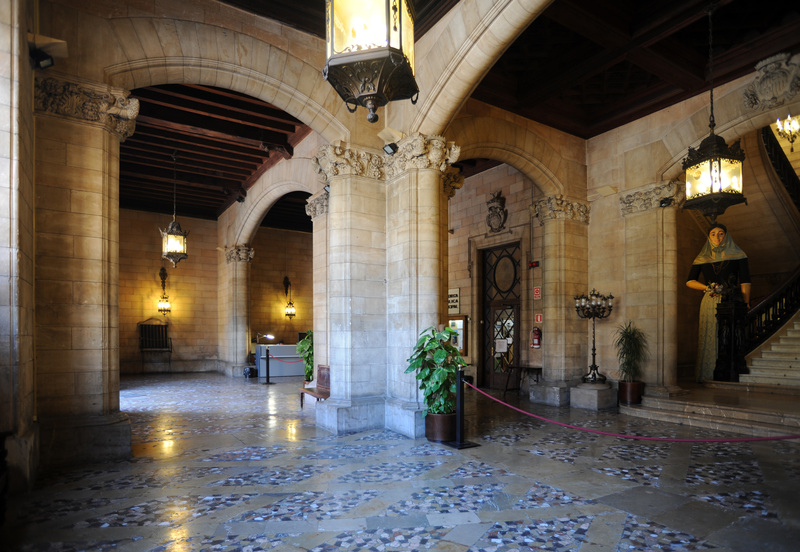 A general transformation of the building, including the beautiful patio decorated with marble columns, was undertaken by the Valencian Jaume d’Espinosa. This transformation was a model, with greater or lesser extent and more or less success, to transform most of the patios of Palma. In this house was hatched the plot Philippist for the Bourbons during the War of Spanish Succession. At No. 15 Carrer de Can Savella, is the Can Catlar del Llorer. The remains of the thirteenth century belonged to Moix family and was acquired in the seventeenth century by the Dezcallar family, which it takes its name. In the nineteenth century, it was bought by Doña Maria Agnes Ribera i Garau, descendant of a wealthy merchant. 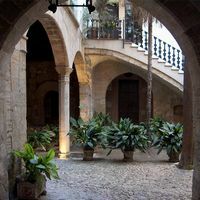 This patio is among those that have been preserved, the oldest of Palma. The building, in the Gothic style, is remarkable for its arches, octagonal columns and its entrance. There a few years ago during renovations done by the owners, it was discovered Gothic murals, now preserved at the Museum of Mallorca. The Can Ribas de Pina is located at No. 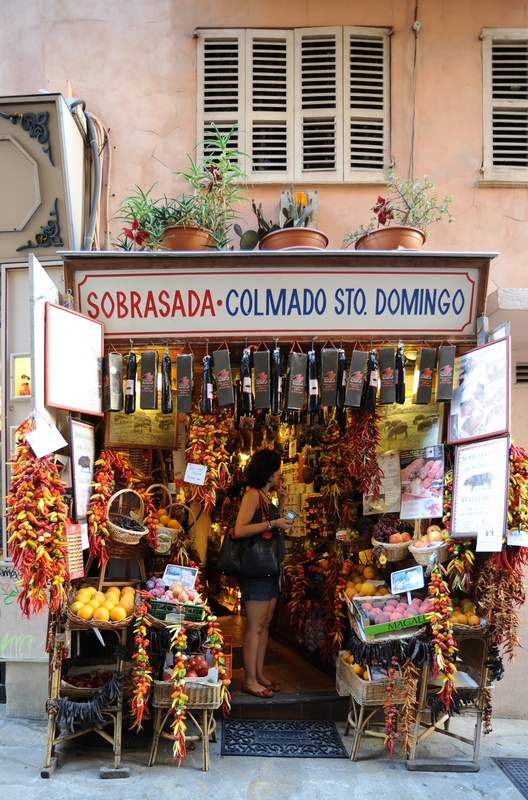 23 Carrer de Can Savella, right behind the church St. Eulalia. 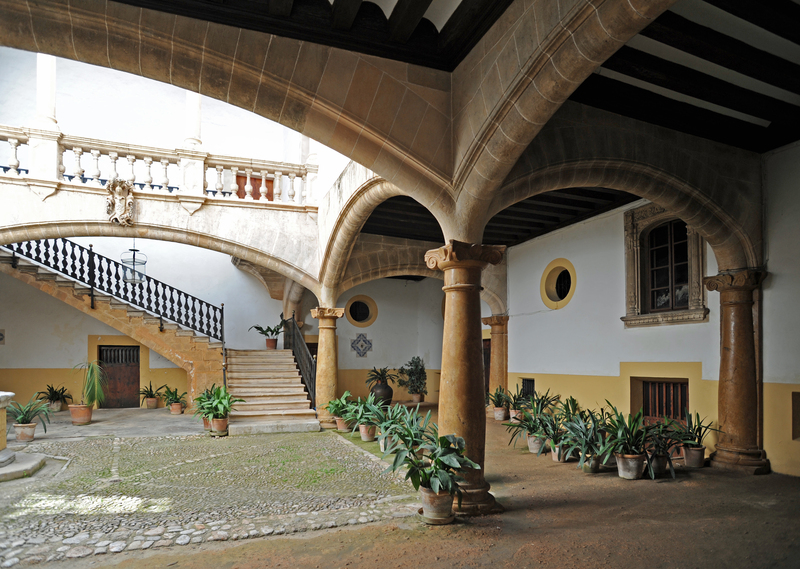 This hotel in the seventeenth century became the residence of the Ribas de Pina family from the early eighteenth century, it was acquired in 1718 by Miquel Ribas de Pina i Ferra. Since that time business was a series of changes throughout the building: a pillared porch and wooden louvers were added, and the Gothic windows of the facade were walled patio and was renovated while preserving the characteristics of the patios of the seventeenth century. The front still left guessing the original layout with mullioned windows and the overlap of the gantry. The Can Amorós at No. 1 of the Carrer d’En Morey is a completely rebuilt in 1970 by architect Josep Ferragut remains. The original house were only kept the patio with arches and columns of red marble of the eighteenth century and restored in the nineteenth century staircase. A central column is used to support four segmental arches. 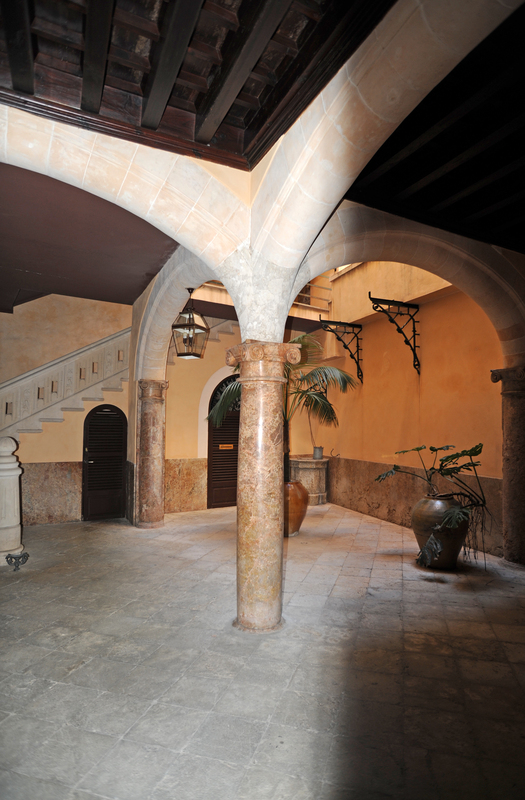 In his book on the city of Palma, the Archduke Ludwig Salvator called this house "Can Meliá". The Can Ordinas d’Almadrà (Antiga Can Vivot-Santjoan) is located at No. 8 Carrer d’En Morey who share the Place St. Eulalia. 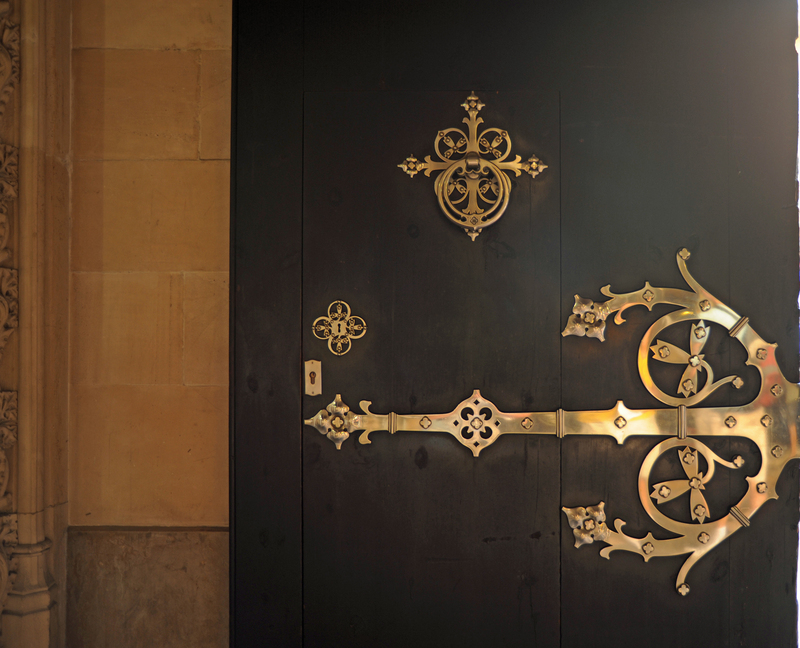 This house is an interesting example of late Gothic, rebuilt in the seventeenth century and in the twentieth century has undergone a profound transformation. 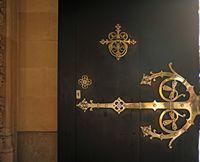 We note in this patio matrimonial badges families Vivot and Santjoan and, right, the door late Gothic giving access to one of the rooms of the house. 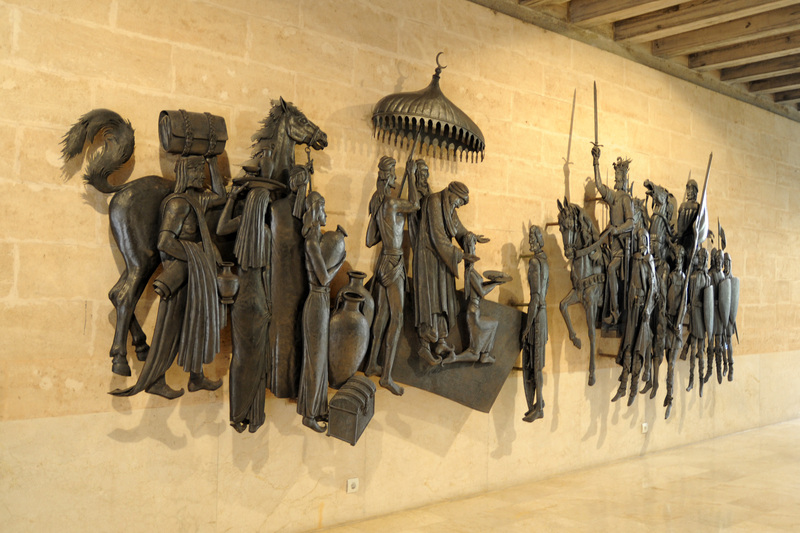 Here we see one of the best examples of this type of sculpture existing in Mallorca. 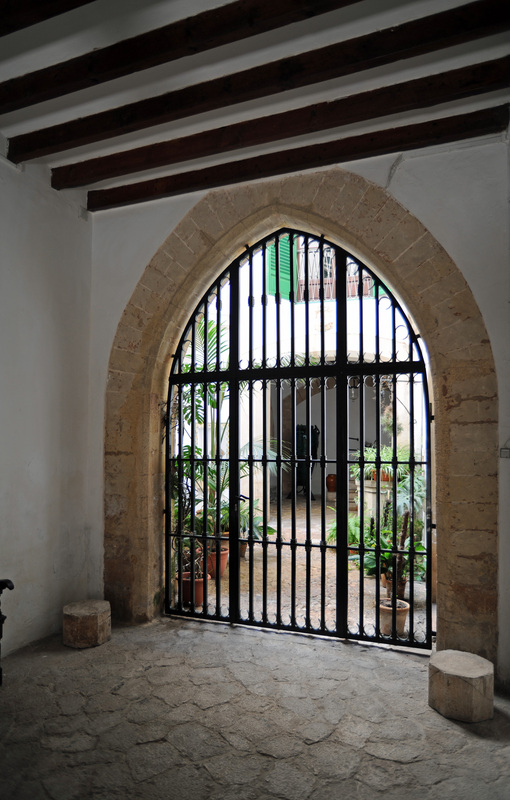 At the entrance, one of the oldest parts of the patio there are two gates made at different times: the right to the late Gothic style, with beautiful reliefs, unique in Mallorca for its typology and the left, the Renaissance. At the end of the patio, stand the arc and reduces the side staircase leading to the main floor. At the end of the staircase is a preserved funerary inscription found during the renovation of the house, dedicated to Manlia Severa, a Roman woman. The mid-twentieth century the building has undergone a major transformation with the construction of the loggia overlooking the patio, in this work was discovered a Roman tombstone that can be seen against the wall that is in the vault. At No. 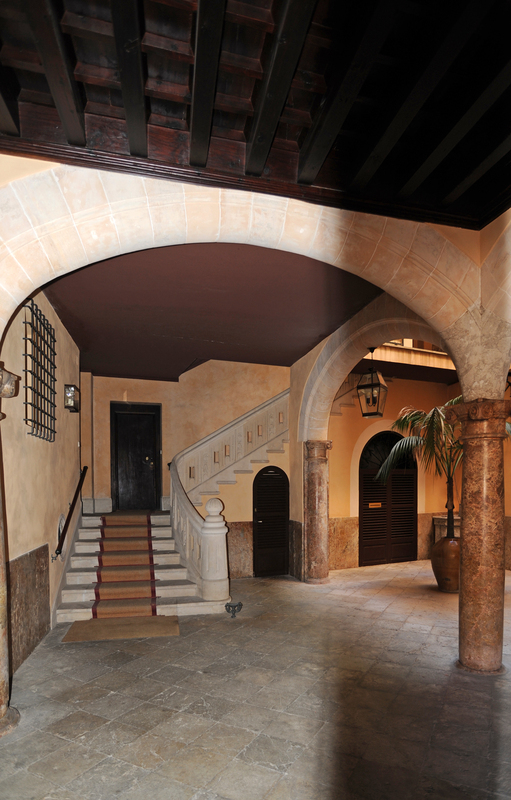 9 Carrer d’En Morey, the Can Oleza is a sixteenth-century Baroque elements with some of the late seventeenth century in which all elements are present that would later become the mansions of Palma vaults very lowered to lighten the structure, a loggia that connects the most utilitarian of the house with the staterooms; Ionic columns to "entasis" very pronounced, the wrought iron railings. The harmony of the composition created the style for renovations that were made ​​during the eighteenth century. In the seventeenth century Can Oleza was owned by the Descos family, whose coat of arms appears on the Renaissance window to the left of the outer gate. 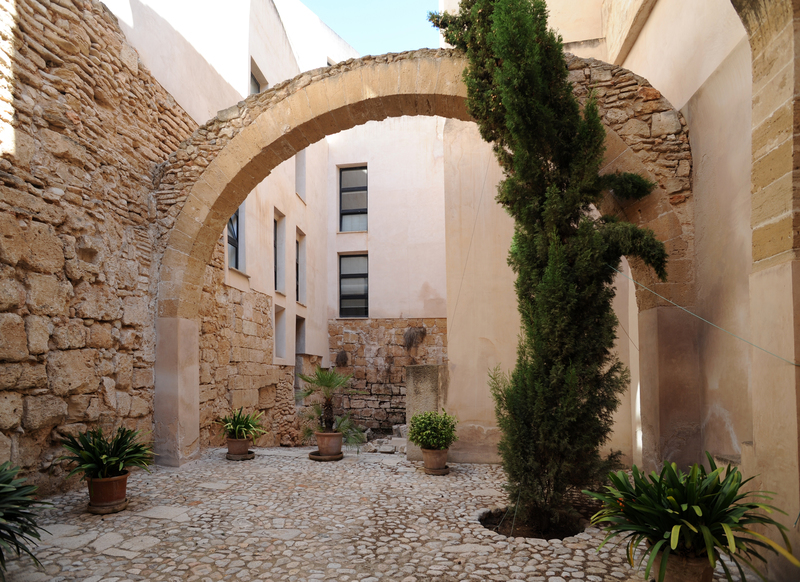 From the entrance, you enter the patio through a rectangular courtyard characteristic of the Italian Renaissance. The open gallery or balcony, located above the side staircase, reduced arches and windows with reliefs, are a clear example. 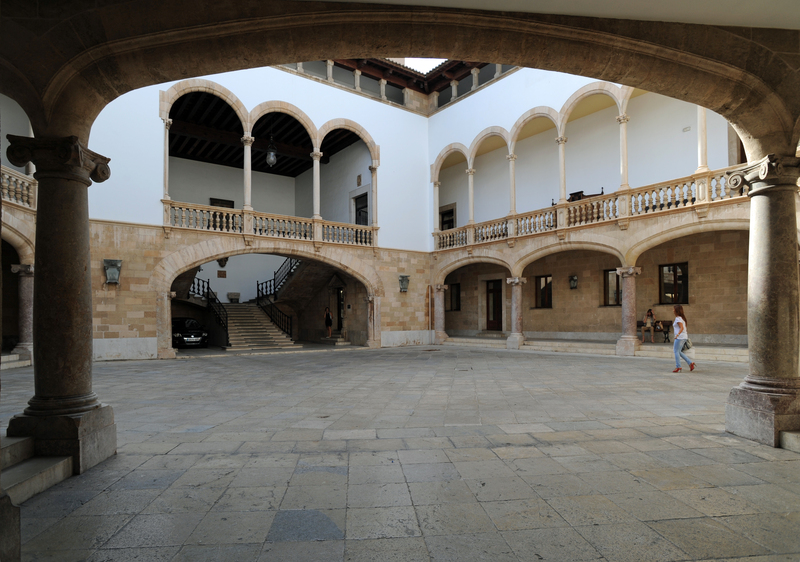 Columns and balustrade of the open gallery suggest the Baroque style which will take place slowly in the courtyards of the city. The Can Oleza was classified as a historical monument in 1973. 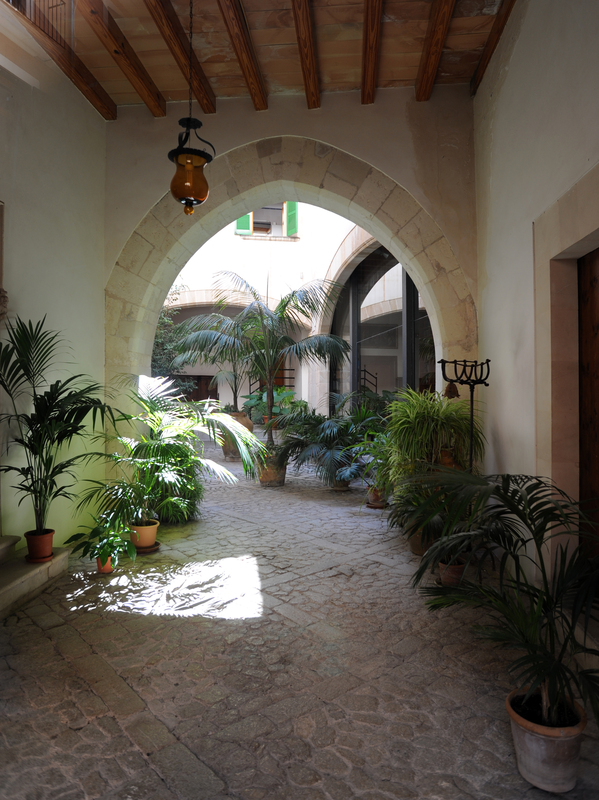 The Can Frontera number 8 Carrer de Miramar is a medieval courtyard, and with possible changes in the seventeenth and eighteenth centuries. A major renovation was completed in the first half of the twentieth century by the engineer Joan Frontera Estelrich its owner. This renovation result historicist patio area with some decorative elements such as windows and colorful cast iron railings. The Can Frontera was converted into a hotel, the Palacio Ca Sa Galesa hotel. The Can Oms at No. 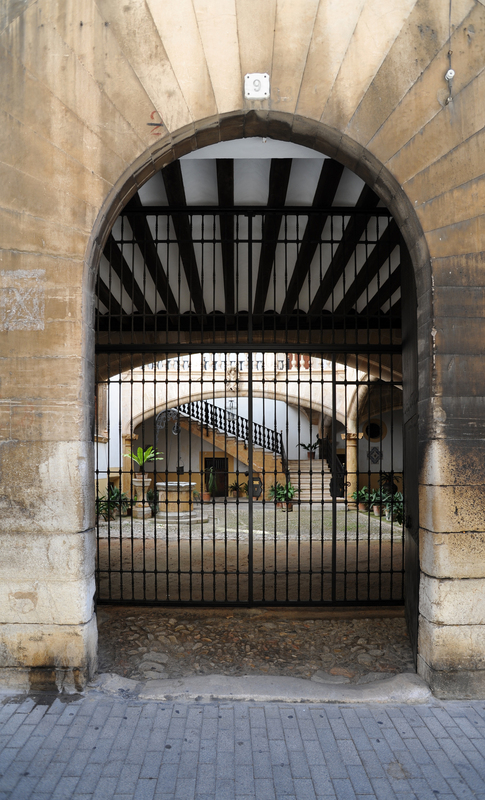 7 Carrer de Almudaina, is still occupied in 1642 by the Oms family whose arms are visible on the ornate balustrade. The patio is the result of changes in the eighteenth century. The segmental arches, the upper railing, window, balcony railing and lintel and the side staircase, stone Santanyí, with its wrought iron railing, are the characteristics of this particular hotel. 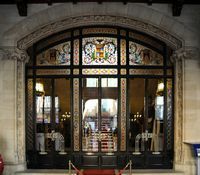 The Gothic portal located to the left of the hall bears the arms of Armadans and comes from the medieval house of the family that still exists in the street Can Sanç. The staircase leads to a large gallery, the shield of Oms shines the balcony window located above the stairs. The same number 7 Carrer de Almudaina, there is the Can Mesquida is a home rebuilt on medieval foundations of two houses located in items 1 and 3 of the same street. In the sixteenth century (1576), it belonged to the family Sureda Sanglada. In 1818, it was owned by Maria Josepa Mesquida, whence comes its name. It is accessed by a semi-circular portal, expanded its base by "escopidors" for the passage of carts. At the entrance, the ceiling is divided into two sections by a low central arch. At the bottom of the stairs the court of the nineteenth century is. The Can Bordils, located at No. 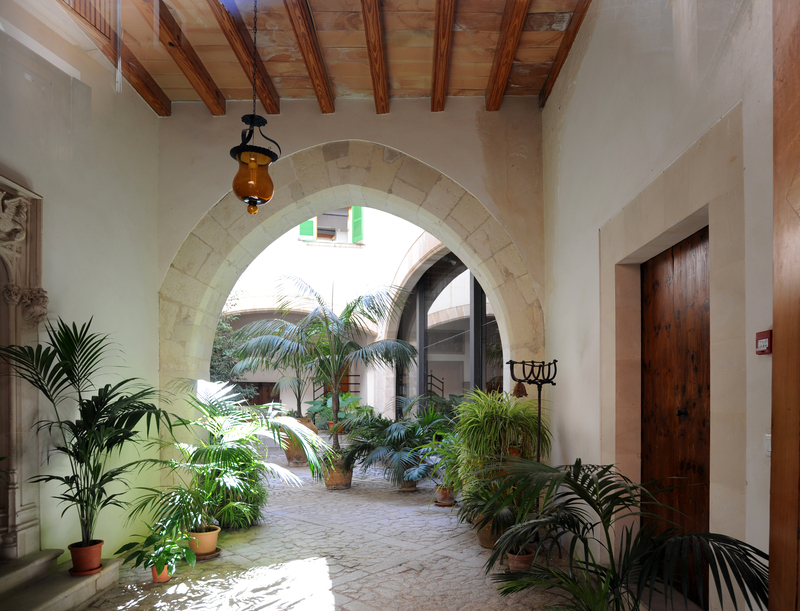 9 Carrer de Almudaina is a medieval house restored in the sixteenth century by the Sureda family, whose coat of arms can be seen on the exterior windows of the office - Renaissance - and different parts of the patio. 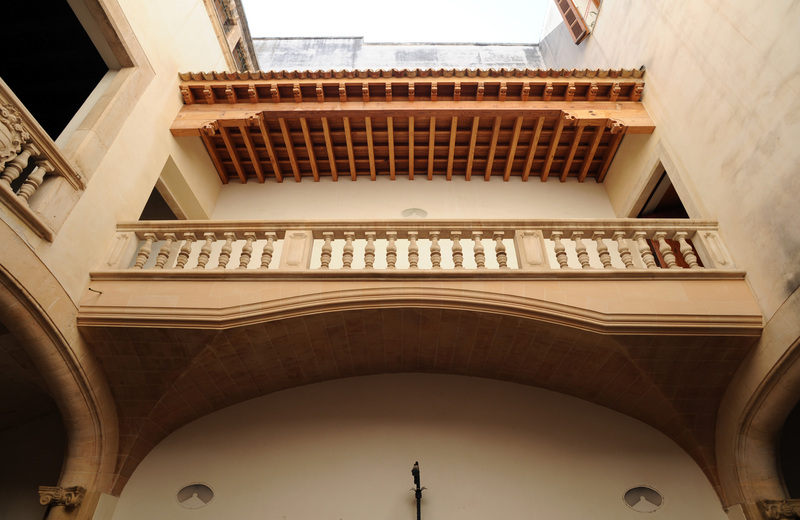 The patio, which certainly dates from the seventeenth century, was restored in the nineteenth century, and finally modified by the architect Guillem Fortesa in 1941, when the current was designed staircase. 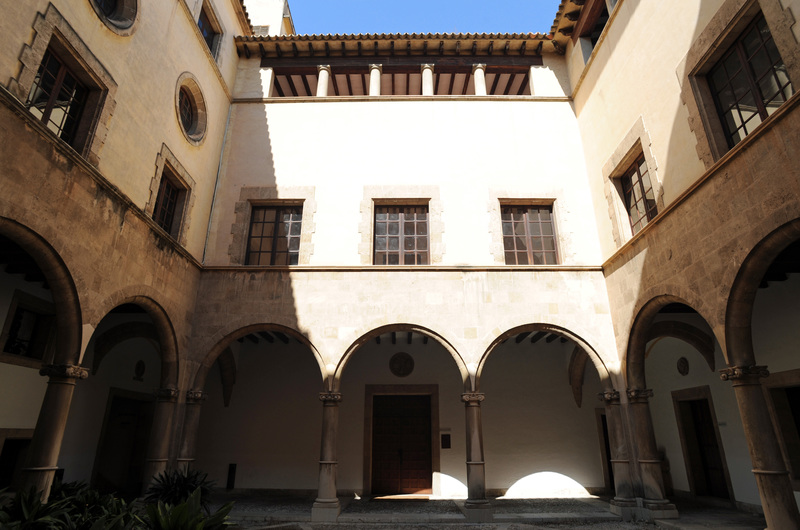 A project of the architect Miquel Vicens restored the original appearance of the house to make it the seat of the Municipal Archives Palma (Arxiu Municipal). 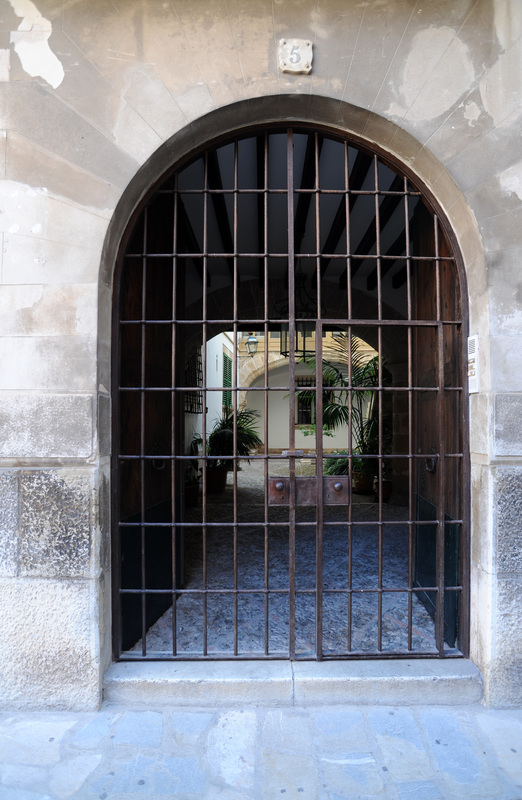 The court has a typical structure, fenced porches formed by columns and semicircular arches. Opening hours: Monday to Friday, 9:00 to 14:00, Mondays and Wednesdays, from 16:15 to 19:45. To the right of Can Bordils is an arc that crosses the street: it is the Arch of the Almudaina, one of the few remnants of the defensive wall of Palma. It is almost certain that this arc was already part of the Roman wall that protected the city from the Antiquity until the thirteenth century. The building, located at No. 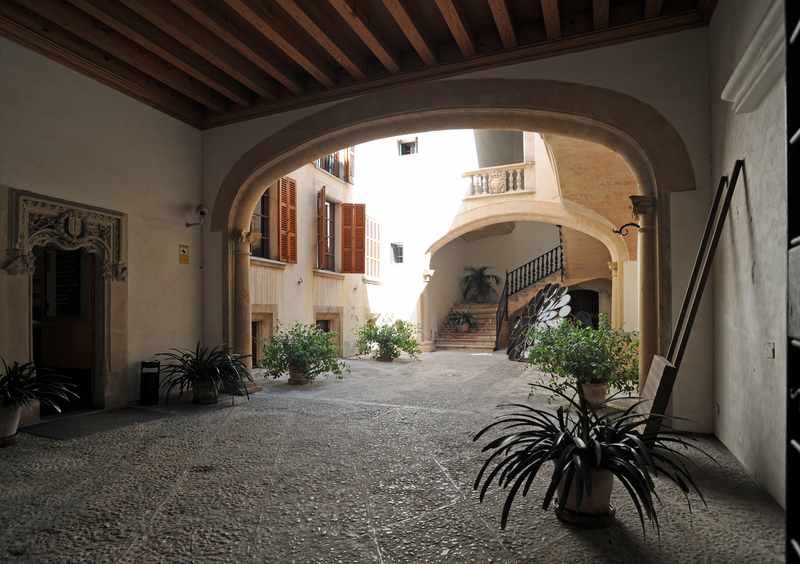 4 Carrer de Sant Roc, on the corner of Carrer de l’Estudi General, is linked to the creation of the University Llull of Majorca. After the demise of this institution, the building housed an active cultural center housed institutions like the Provincial Academy of Fine Arts, the Provincial Commission of Monuments, Royal Economic Society of Friends of the Country (Real Sociedad Economica de Amigos del País). The current building - designed by architect Gabriel Alomar - replaced an earlier building in 1950. 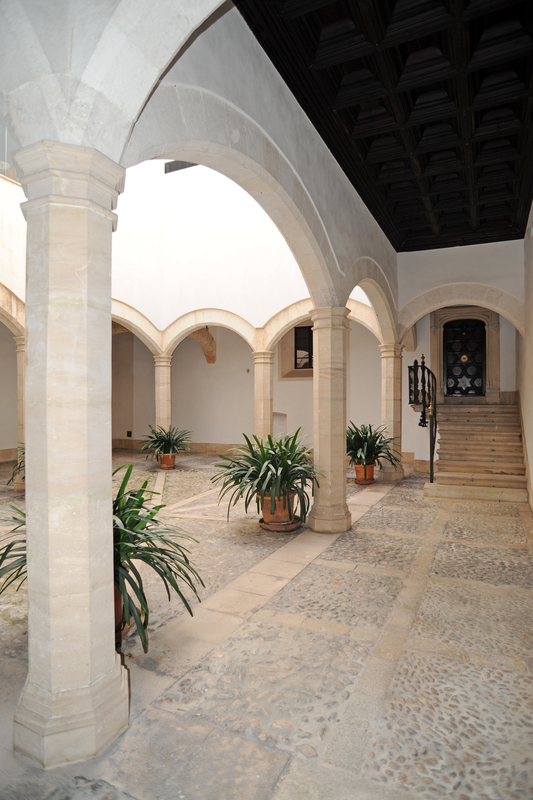 The patio meets the baroque typology with semicircular arches on Ionic columns. Also of note, on the upper floor, some mullioned windows. 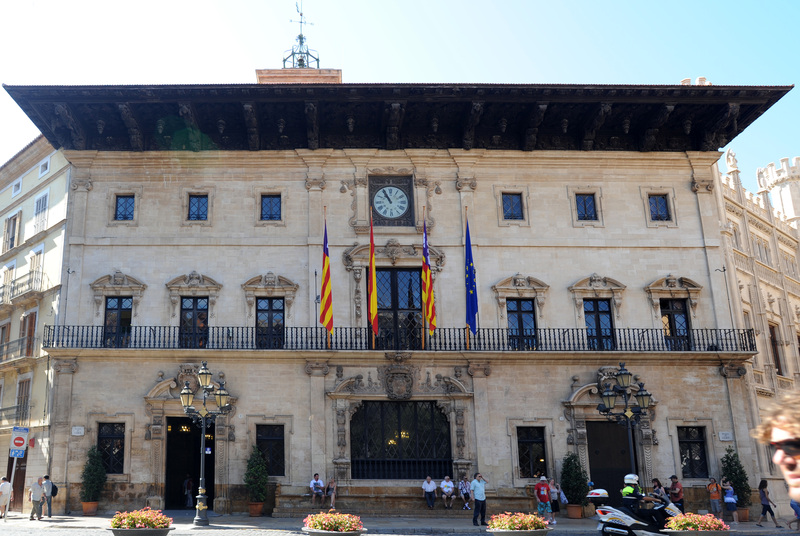 The building of the Chamber of Commerce was designed by the architect Pere Garau in 1973 and inaugurated in 1975. It is located at No. 3 in the Carrer de l’Estudi General, on the site of an old mansion belonging to Pau Ramis 1818. Garau provided a highly transparent access space, covered by a ribbed concrete slab. At the bottom of the stairs is next to the courtyard garden are located the remains of the earlier building. The project combines traditional and functional. 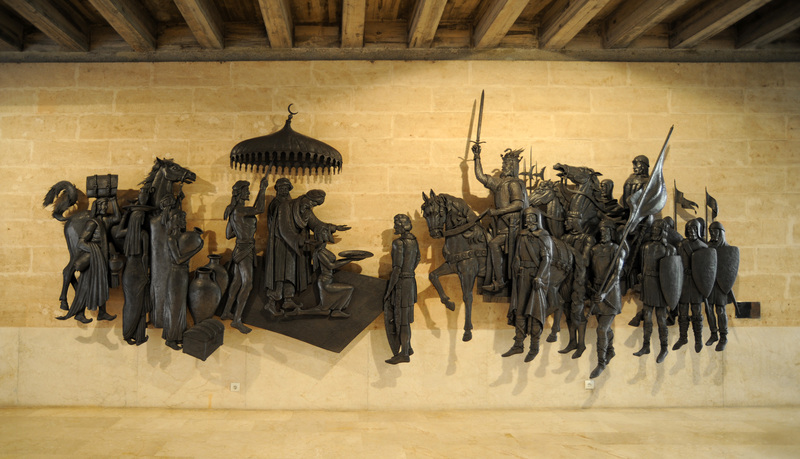 On the left of the entrance hall we see a mural depicting the historical event of the keys to the city by the Almohad governor Abu Yahya Jaume I, nicknamed "the Conqueror". This work, carried out in workshops Guillem Segui was forged and extended hand of iron plate of 3 mm, and its weight is about 1 000 kg. Its construction was started in 1976 and ended in December 1981. 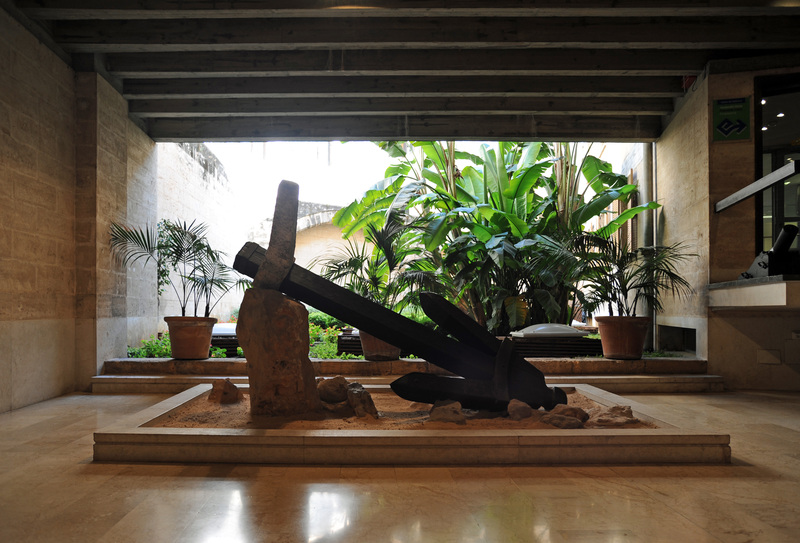 In the middle of the hall is a Roman merchant ship anchor medium type, probably dating from the third century BC. At the bottom, near the garden, the remains of architectural elements of the old building. The Can Alemany is located at No. 5 in the Carrer de l’Estudi General. 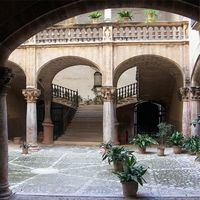 The building dates from the seventeenth century, and has a patio characterized by a curious mixture of elements from different eras: a Gothic staircase, octagonal Gothic pillars, prior to the eighteenth century, supporting segmental arches, and a gallery of the nineteenth century. The façade, with three floors, has an arched portal and a door a little more to the right. On the first floor you can admire two balconies and a window, balcony, under the porch, small octagonal pillars. 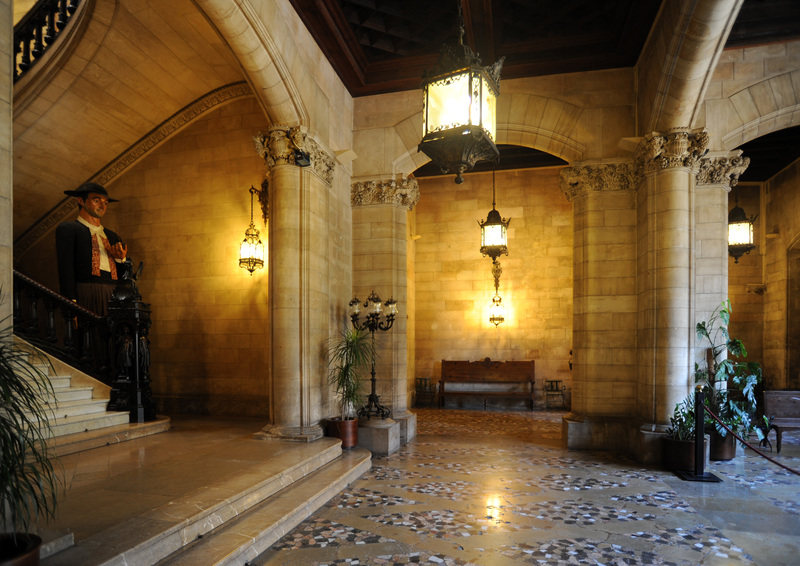 The lobby is covered with a beamed ceiling and to the left, over a small staircase, there is a hall with a semicircular arch, which leads to a room. On the right is a portal surmounted by a lintel. 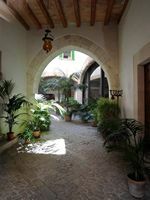 An archway leads to the paved patio that reveals, on the right, a medieval period staircase that maintains a well octagonal tank. 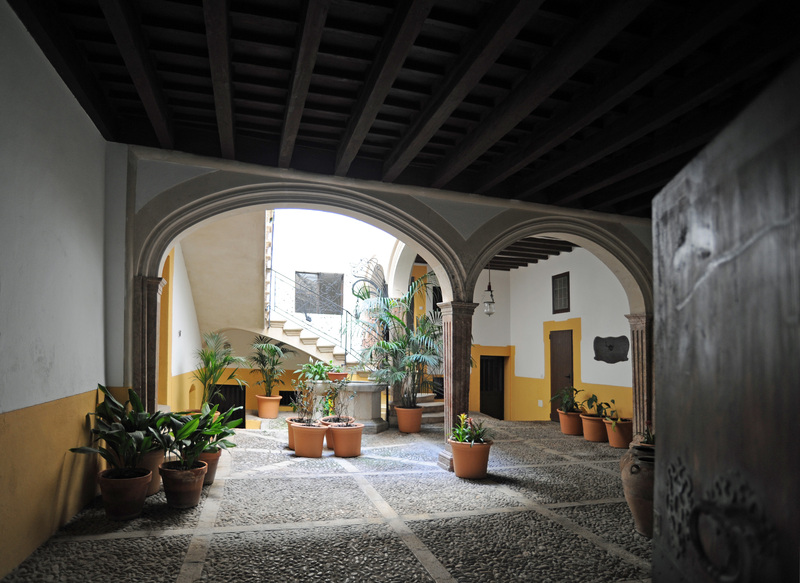 The house belonged to the sixteenth century to the Gual-Moix family. 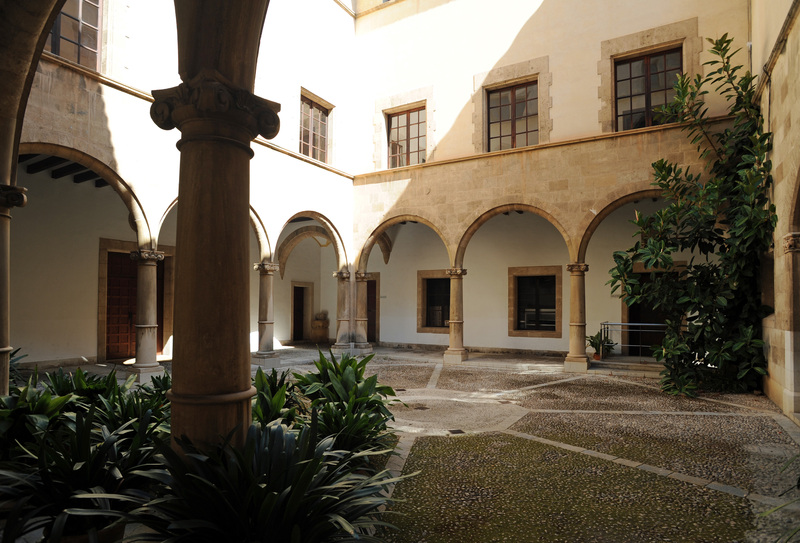 In 1628, it was acquired by Dr. Joan Jaume Alemany. 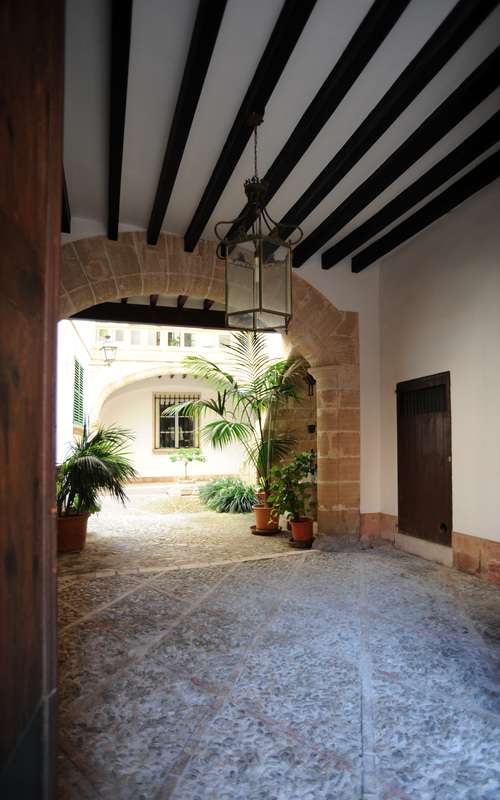 In the eighteenth century it was the residence of columnist Joan Jaume Alemany i Moragues (1693-1753), author of a History of Mallorca. The Can Marques is located at No. 2A Carrer de Zanglada. This part of the building, formerly held at No. 2 present in the same street, has many details of modern style - added during renovations - which are visible both in the decoration of the patio as that of the stairs; this staircase is a modified element of the original building, dating perhaps from the seventeenth century. This juxtaposition of styles gives the house an eclectic architectural originality. 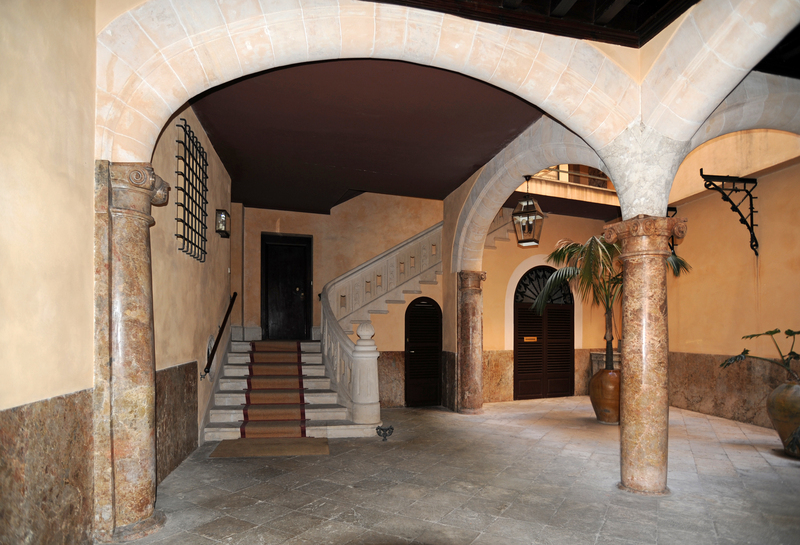 Visit: the circuit with 10 rooms, fully furnished, in Can Marques reveals part of the life of the bourgeoisie of Palma in the early twentieth century. Hours: daily except Saturdays, Sundays and holidays from 10:00 to 15:00. This information is found in all the guidebooks and maps of the city of Palma, in reality, Can Marques can not be visited by a decision of the owner. The Can Marques is being restored. At number 4 Carrer de Zanglada lies Cal Poeta Colom. In 1576 this house belonged to Pere-Ramon Safortesa. From the seventeenth century the house belonged to the family Fontirroig, then, in the nineteenth century, it was acquired by the Crespí de Garau family, whose members distinguished themselves as notaries. 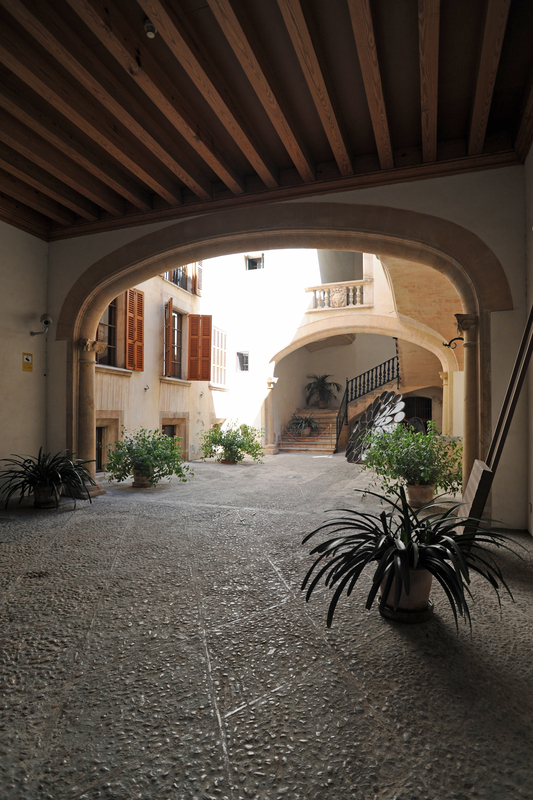 In 1933, it was acquired by the lullist poet from Sóller, Guillem Colom i Ferra, who made ​​it his residence. The house has undergone several transformations, one at the end of the eighteenth century, one in 1936 and one more recently. 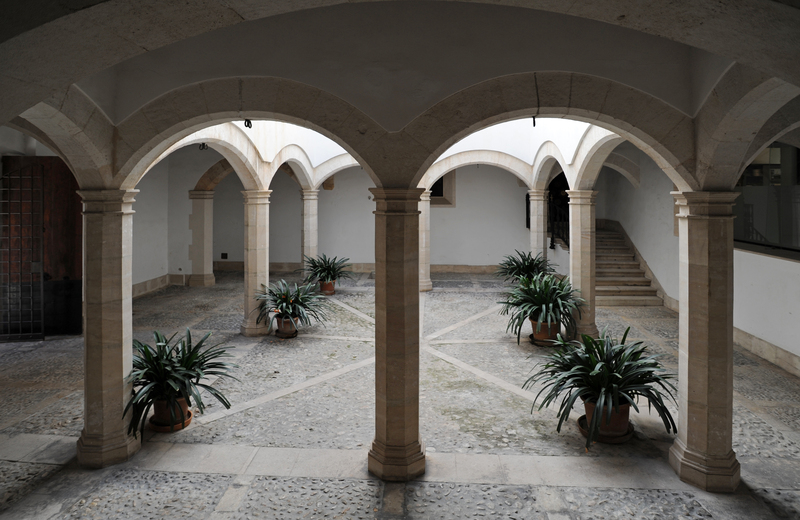 During the reform made ​​at the end of the eighteenth century, the patio has adopted the current typology, which combines local tradition with the aesthetics of French baroque, classical significantly. The patio of the eighteenth century, characterized by the use of pilasters singular instead of the usual Ionic columns - pilasters shaped furniture legs. The patio also provides an interesting contribution to wrought iron, both on the banister and the hoop iron tank, also with balconies on the first floor with wrought iron. The portal is low arch. The Archduke Ludwig Salvator called this house "Can Garau"
"With fluted marble columns, square, which extend from the base to capital." The Can Muntanyans is at No. 3 Carrer de Sant Bernat. In the fifteenth century it belonged to the family Muntanyans a famous line of particular importance in the intellectual world of the city of Palma. A prominent figure of this line was the canon of Nicolau de Muntanyans, who became inquisitive, and, like other members of his family were humanistic concerns and agreed with the new cultural climate of the Renaissance. One of the arms visible in the courtyard, on the left is that of Muntanyans-Berard family and dates from the fifteenth century. The origin of this blazon of marriage comes Nicolau de Muntanyans Verí and Beatriu de Berard Santjoan. In 1556, the house was owned by Humbert de Togores Muntanyans. In the seventeenth century, Can Muntanyans, located near the apse of the cathedral, became the property of the Church and the residence of the canons sextons, as St. Peter and St. Bernard neighboring former hospital. For this reason, the building is also known as the "Sacristanat". Today Can Muntanyans is integrated into the retirement home for elderly priests established in the Baroque building of the Fraternity of St. Peter and St. Bernard. Despite the renovations, the house still retains the Muntanyans important Gothic elements, such as the entry of the study with the crest of the family, the arches of the patio and the interior rooms, and a set of badges representative of Late Majorcan Gothic. During the first three decades of the twentieth century lived here the canon and writer Antoni Maria Alcover i Sureda, as recalled by one placed to the right of the portal plaque. The house was renovated in 1990. At number 13 Carrer de l’Estudi General, is the Can Ferrer. This house dates from the late nineteenth century, but the patio was created in 1953 during a renovation of the house. Since sober inlet passage, you enter the house through the patio, passing under a Gothic arch, discovered during the renovation. At the end of the patio, we noticed a patch that was excavated from the Place du Rosaire, specifically the monastery of St. Dominic now disappeared. This badge has a cross with a lily flower shape and a star above. The patio is still modest in size, but retains some traditional elements. Carrer de l’Estudi General Lul.lià home at No. 15, the Can Llorenç Villalonga. It was, until his death in 1980, the house of the twentieth century Majorcan writer Llorenç Villalonga. It was owned by his wife, Teresa Gelabert i Gelabert, from Binissalem. Since the nineteenth century the house was linked to families of this city. 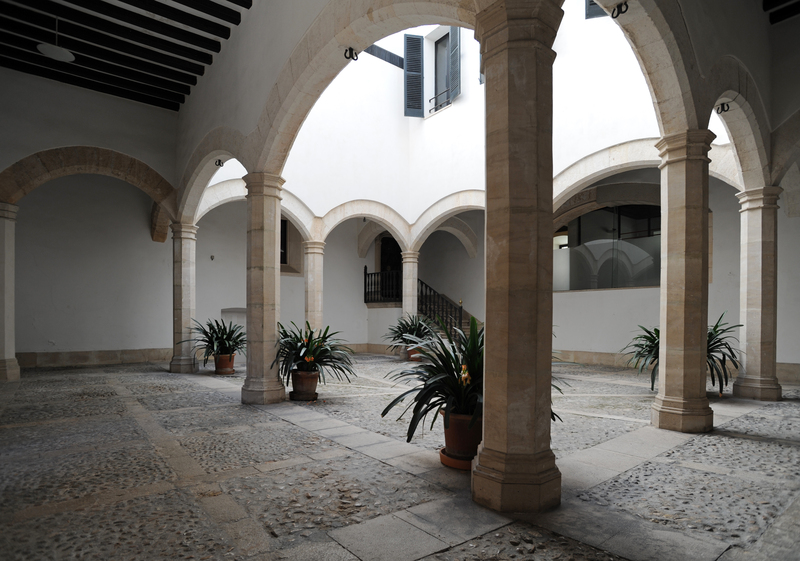 The patio, which probably dates from the nineteenth century, adopted the traditional model. It has a double inlet passage with arches, and remains of medieval elements such as blinded arc on the wall on the right side of the stairs. Go to the Cathedral Quarter.